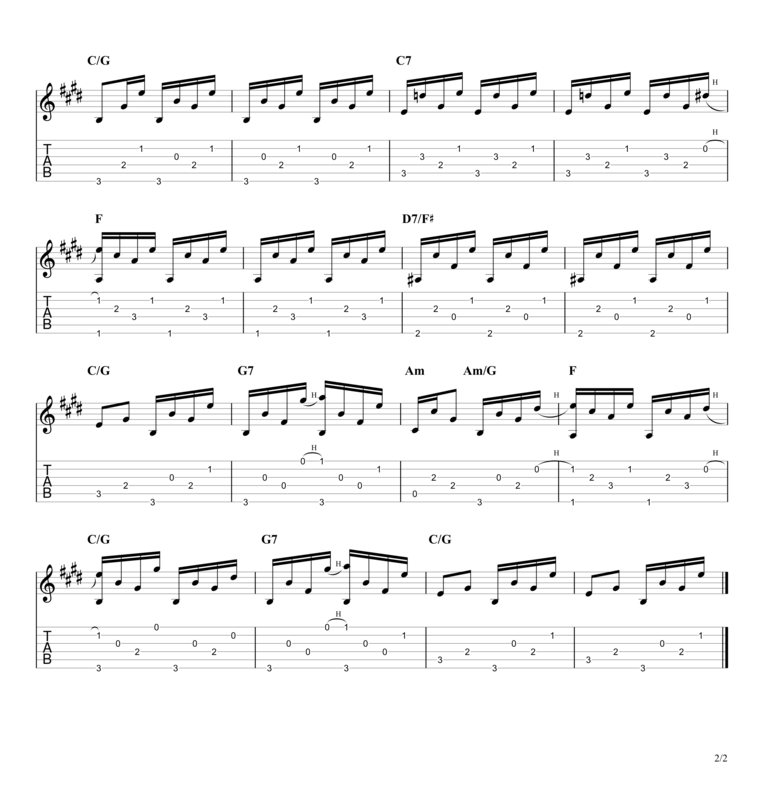 Scroll down for full video lesson (with tab) of Don't Think Twice It's Alright. Don't Think Twice It's Alright was written by Bob Dylan in 1962 (released in 1963) and appears on his album 'The Freewheelin' Bob Dylan'. This is an early song of Dylan's and a very well-known one; it has been covered by many people and continues to inspire up-and-coming folk artists all over the world today. The song was written after his girlfriend of the time, Suze Rotolo, left him in New York to go and study in Italy. He claims it's not a love song, but instead "a statement that maybe you can say to yourself to make yourself feel better." Don't Think Twice It's Alright certainly has some challenges in it. 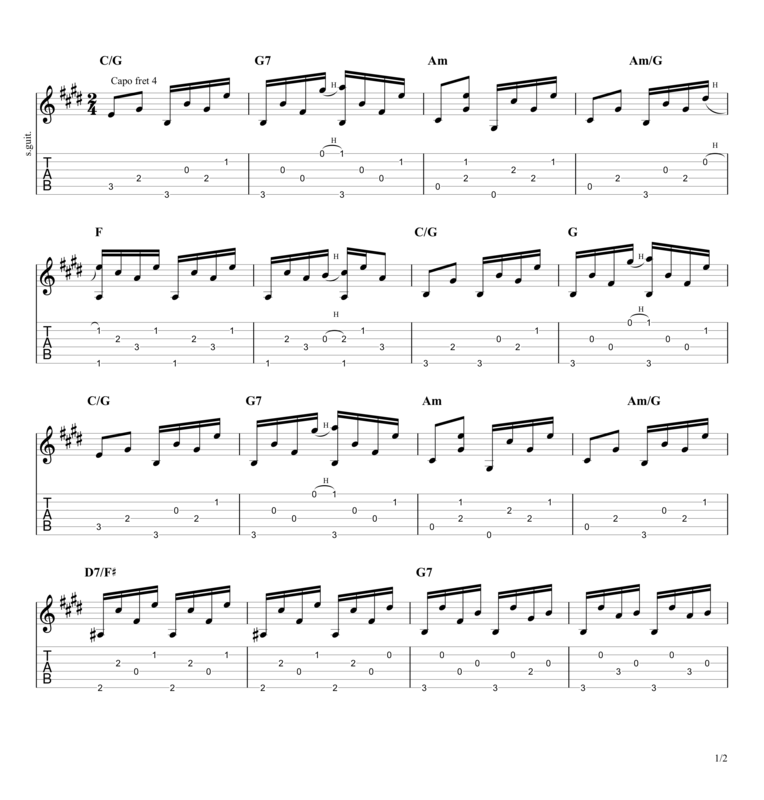 It's fast paced with a tempo of roughly 111 bpm, so your fingers are really on the move! The chords are thankfully straight forward enough and are just your normal open position shapes. However the most peculiar thing I found when first learning this song is the funny bass notes. 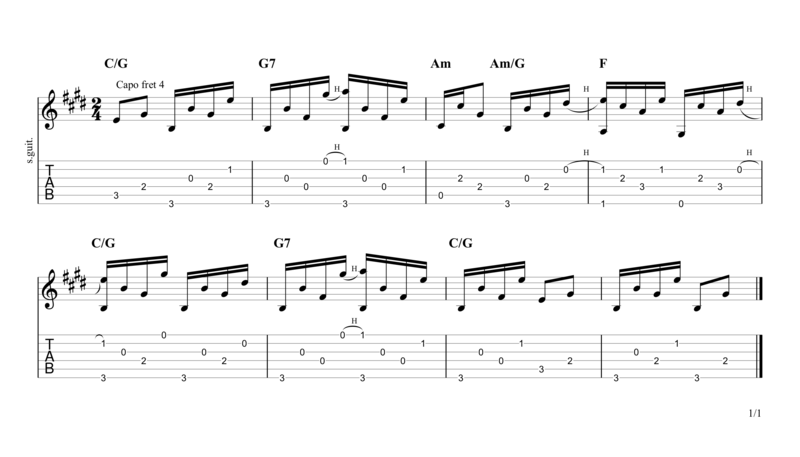 Throughout the piece Dylan often plays the V of the chord on the first beat of the bar i.e when playing a C chord he'll play the note of G on beat one instead of C. If you've been fingerpicking for a while this will likely feel really strange. Whether he intended to do it or he just did what felt right to him I can't be sure, but it really is unnatural and uncomfortable to play at first. Don't Think Twice It's Alright is no. 23 on my Top 60 Fingerpicking Songs of ALL TIME list. 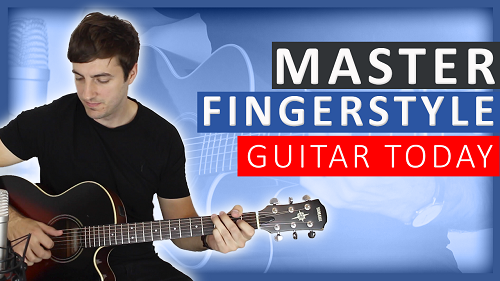 If you've not seen the list be sure to check it out and sign up to my weekly email lesson so you don't miss learning any of these great fingerstyle songs. Another thing to watch out for are some of the nasty hammer-ons that pop up. They're very fast and often you have to play the bass note at the same time that hammer-ons land. If this doesn't make sense right now you'll soon realise when you get to one. The verse of Don't Think Twice It's Alright is similar to the intro but there is just more of it. More twists, turns, funny bass notes and awkward hammer-ons. Dylan's timing on the recording weaves a lot; however, I do recommend (as always) pulling out your metronome and seeing if you can play it in time and up to speed once you get to grips with it. 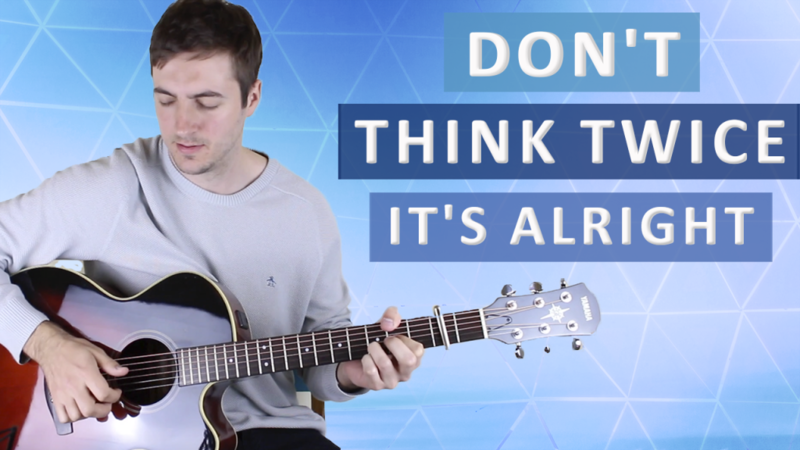 Don't Think Twice It's Alright is in the key of E major; however, as guitarists we plonk a capo on the fourth fret and pretend it's in the key of C. So I'll explain everything in guitar terms for simplicity. The song's verse chords are almost all diatonic to the key (notes/chords within the key); first off it plays I (C), V (G7), vi (Am), IV (F) and then repeats the same four chords but replaces the IV (F) with a D7 chord. D7 isn't diatonic to the key of C major, normally the D chord in the key of C major would be minor. The D7 here is a secondary dominant chord, it's the V chord taken from the harmony of G major. By briefly putting this chord into the progression you actually nip out of key for a second and then return again as soon as you play the next chord, in this case you return to G - the V chord of C. So the D7 chord sets up the G7 really well because it's 5 steps away and this creates a perfect cadence. Bob Dylan (born Robert Allen Zimmerman) was born on May 24th 1941 in Duluth, Minnesota. Dylan has been a hugely influential figure in popular music for over 5 decades now and continues to tour extensively on his 'Never Ending Tour', a tour that started in 1988 and continues to this day! Dylan's work in the early 60's gained him a vast following spread right across Europe and the States. However, he created a huge controversy with them in 1965 when he decided to retire his much loved acoustic strings and protest songs and plug in a shiny new electric guitar at Newport Folk Festival in Rhode Island. Many of his diehard fans were horrified and completely outraged that he'd done this, they booed as he played with his new hard(er)-hitting band mates and cursed his playing. Clearly they didn't want the change and felt he'd betrayed them. However, as time marched on people warmed to his new sound and accepted his edgier style, and his first electric single 'Like a Rollin Stone' became one of his best known and most loved songs. It was a bold move by Dylan that paid off greatly in the end. Thiѕ site truⅼy has all the info I wanted concerning this suƄjeϲt and didn’t know ѡho to ask. Superb tab, superb lesson. Thanks a lot.